Toga-clad students, including the nursing delegation from Changchung, China, packed North Gym to capacity last night for the annual Mr. GCU pageant. Nothing could prepare our Chinese visitors for what they were about to see, but they jumped into the festivities with glee. 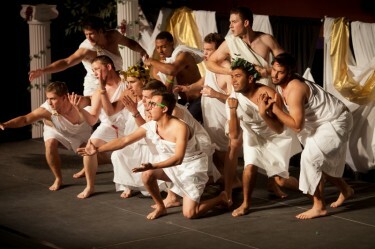 It wouldn’t be an ASGCU event without a heavy dose of lip-syncing, cross-dressing and man flesh. These are some of the best and brightest young men on campus and those in attendance will never be able to look at them the same way again. Hosts for the evening were Catie Whiffen and Matt Muchna and judges included Pastor Tim, College of Nursing Dean Dr. Anne McNamara and 2011 Mr. GCU Chris Borowy. The less said about the swimsuit competition the better. The talent portion of the evening was…varied. Junior pre-med major James Prigge “played” a “glass harp” with plastic cups, wearing what must be his sister’s hot pink prom dress. One of the most talented of the contestants, junior vocal performance major Sam Brunner, parodied the Miranda Sings Youtube videos. Only a true singer could sing that awfully. Junior sports management major Nick Punter ignited the crowd with a dance medley that covered about 40 years of music from Grease to Thriller and some of today’s hits. The British-born Punter also happened to be dressed as the Queen, clearly bringing dignity back to the crown. Robert Ramirez, sporting a sweater Bill Cosby would be proud of, performed a keyboard medley. He mashed in everything from “Don’t Stop Believin’” to the theme from Scooby Doo, and scored the evening’s lone Bieber reference. Senior secondary education major Alam Virgen hearkened back to a simpler time with a swing dance number that had two ladies fighting for his affections. It was nice, maybe even too high-brow for such an occasion. Clad in unfortunately tight spandex and short shorts, sophomore Josh Girgenti summoned the powers of Richard Simmons in an impersonation that brought the whole crowd to its feet and sweatin’ to the oldies. Accompanied by ukulele player Trent Bruns, junior business major James Rood crooned about an unfortunate incident with some flip-flops at a urinal. Following the talent portion, the judges cut the contestants down to five: Steven Egeberg, Tyler Owings, Ramirez, Punter and James Prigge. Judges selected Ramirez as second runner up and Egeberg as first runner up. The contestants picked Egeberg as their Mr. Congeniality. 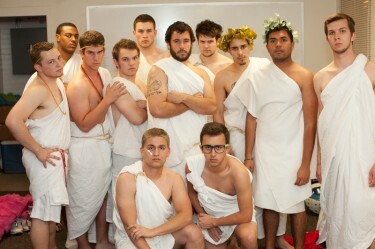 The judges picked the early crowd favorite as the winner, crowning Nick Punter this year’s Mr. GCU. Contact Zane Ewton at zane.ewton@gcu.edu or 639.7086.